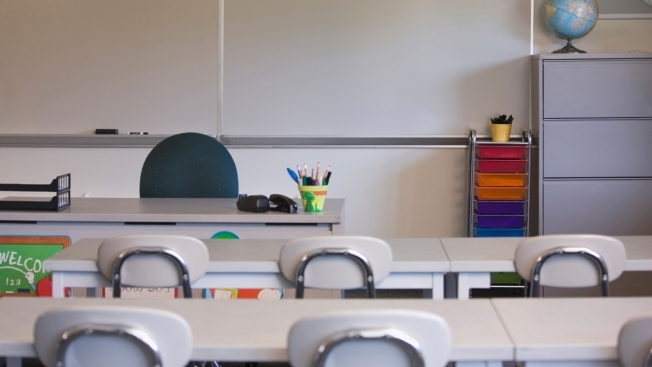 A stock photo shows an empty elementary school classroom. The superintendent of an Idaho school district apologized Friday after at least a dozen elementary school staffers collectively dressed as a "border wall" and in stereotypical Mexican costumes on Halloween at work — and posted them on the school's Facebook page. The employees of Heights Elementary School dressed as a wall in cardboard in a group of costumes made to look like bricks, NBC News reported. The slogan "Make America Great Again" was written in red, white and blue letters across their chests. A handful of other school staff dressed in sombreros, serapes (a long blanket-like shawl) and wore fake mustaches and carried maracas.